Marawila Group Corr. and Prasad Poornamal Puttalam District Group corr. Four persons including three women died and 7 others were injured and hospitalised following a major motor accident involving three vehicles. 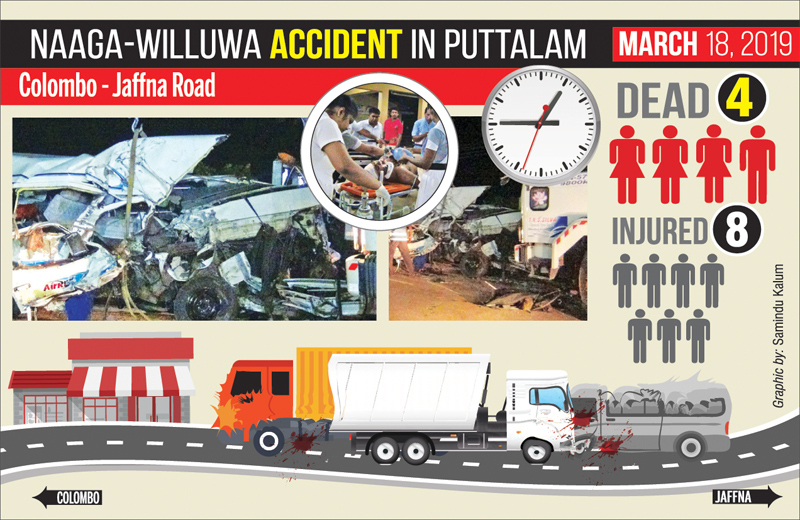 The accident occurred at Naaga-Willuwa on the Puttalam Colombo main road during the wee hours yesterday (March 18). A pregnant woman was among the dead and an infant is among those injured. The accident occurred when a tipper transporting clinker from Colombo to the Puttalam Cement factory struck a stationary lorry transporting goods and collided with a nearby van enroute to Colombo from Jaffna. People travelling in the van from Jaffna had made a stopover at Nagawilluwa to have a morning tea break. The tipper had collided with the van as the passengers got into the van after tea to continue their journey. 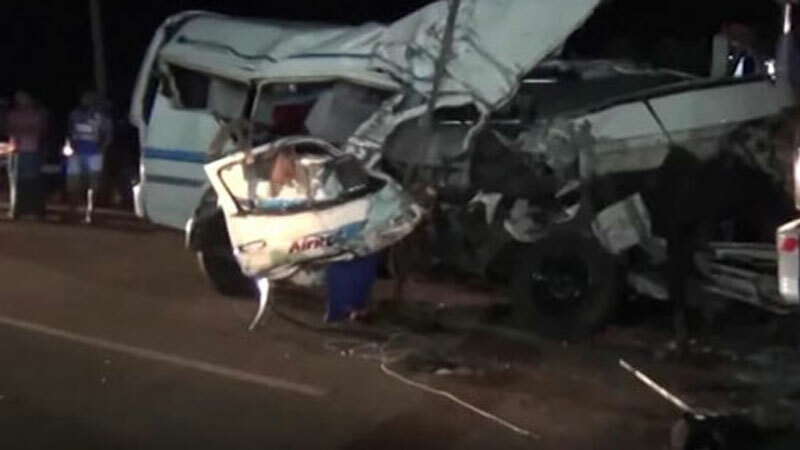 Puttalam Police investigating the incident said among the dead are three passengers in the van and the driver of the lorry. All are residents of Jaffna. Four of the 7 injured were admitted to the Puttalam hospital and were later transferred in a serious condition to the Colombo National hospital. Puttalam Police is investigating under the directions of Traffic OIC D.B. Ratnayake under the supervision of Puttalam HQI Anura Gunewardene. Four persons have been killed while seven others sustained injuries in a tragic motor accident. The accident had occurred at 1:45am this morning in the Naaga-willuwa area in Puttalam. Police stated that the accident occurred, when a van travelling from Jaffna to Colombo carrying seven passengers collided with a lorry travelling in the opposite direction. Nine persons including the driver of the van and a passerby were admitted to the Puttalam Hospital following the accident. It was reported that the passerby and three others succumbed to injuries, stated the police. Puttalam Police is conducting further investigations.